Saints have been handed a big injury boost ahead of Sunday's Challenge Cup quarter-final at Clermont Auvergne. Lock Courtney Lawes, who suffered a calf injury during England's Six Nations defeat to Wales last month, has been training this week and is set to be available for the big battle at Stade Marcel Michelin. And with Saints up against a powerful Clermont Auvergne side, more good news comes in the form of bulldozing centre Luther Burrell. 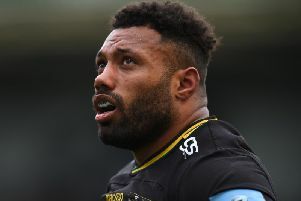 Burrell was suffered concussion that forced him off during the early stages of the Premiership Rugby Cup final win against Saracens on March 17. But he, like Lawes, has been training this week. "Courtney's been training and doing bits so he's looking good," said Saints attack coach Sam Vesty. "Courtney is class, he gives us a different dimension to what we want to do so it's very good to have him back. "Luther has also trained this week. "He's had a couple of days' training and it's been good to have him back as well." Another player to have passed his concussion protocols is Heinrich Brüssow. The South African flanker was withdrawn during the second half of the 29-15 Gallagher Premiership win at Leicester Tigers last Friday. But Vesty said: "He went through some concussion protocols but he's passed." There will be plenty of players vying for places in the squad for Sunday's game, with Lewis Ludlam among those ready to return. Ludlam, who has been hugely impressive for Saints this season, was rested for last week's win at Welford Road. "Lewis deserved that rest," Vesty said. "He's put himself about big time this year. "He probably wouldn't want to look after his body so we had to. "He's been excellent for us."